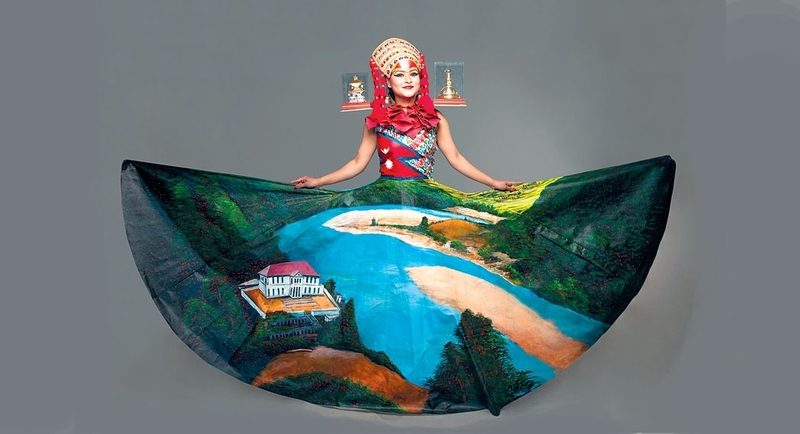 For the first time, we have seen art and fashion come together to create a masterpiece in Nepal. In a graduation program held by the college with the theme World Heritage and Culture, Anita Khatri Chetri, who is studying fashion designing at Namuna College, decided to represent her homeland, in the best possible way. 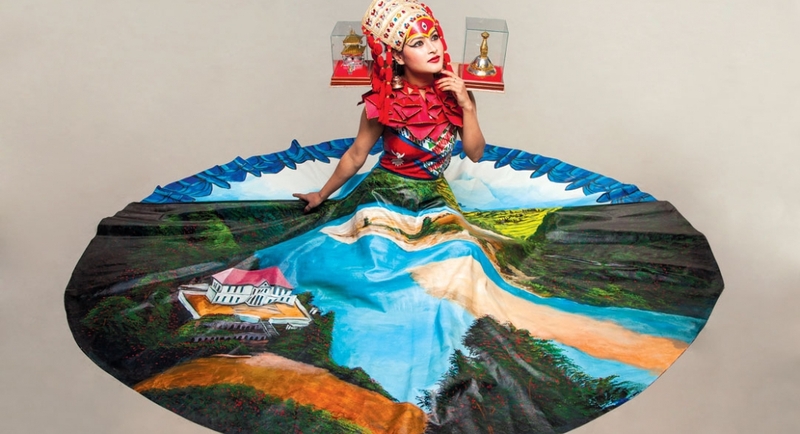 Her masterpiece created quite a buzz, as it was a startling new approach in Nepali fashion with its cultural and historical representation. Her designs stood out among designs from 41 other countries including Norway, South Africa, Venezuela, Mexico, India and others that were presented at the show. When people talk about Nepali pride and honor, it usually focuses on three places: Kathmandu, Bhaktapur and Patan. Anita emphasizes the fact that there are other numerous such noteworthy places in Nepal, just as glorious and significant and wants to highlight them. With that being said, she chose the magnificent Rani Mahal in Palpa to put in her creation, alongside the earthquake obliterated Dharahara. 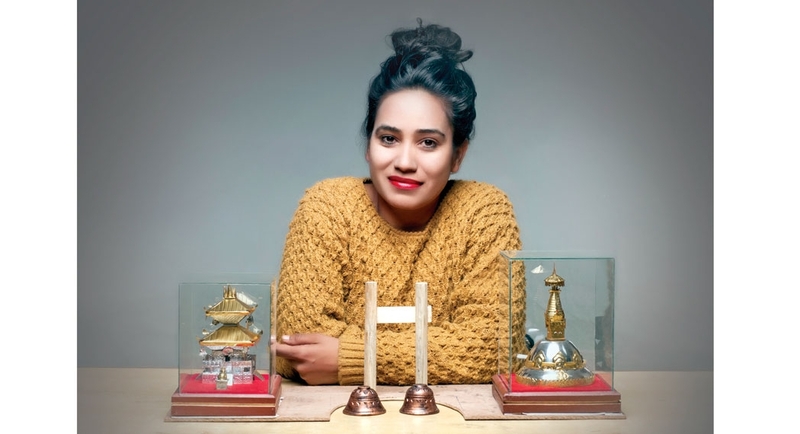 She wanted to incorporate the best of Nepal’s patrimony, and prove that the industry of fashion and fashion designing is so much more than just fabric and thread. The gown primarily focuses on showcasing Nepal’s fine arts and folk aesthetic. It was an empty canvas to which Anita painted the Rani Mahal and Dharahara. 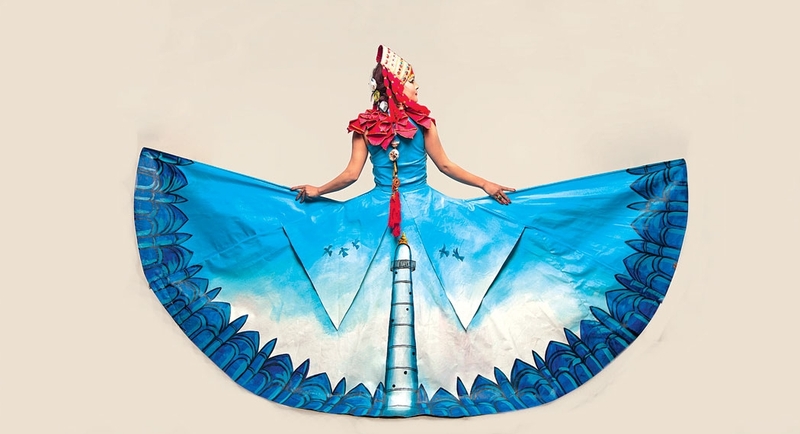 Portraying Nepal’s living culture, the evening gown had the national flag wrapped around the body and has a red collar made of multiple cones, symbolizing the flounces you’ll see in temples. The remaining portion of the bodice is made up of Dhaka fabric, a traditional Nepali woven fabric.In the middle, there are symbols of Lumbini, Janaki Mandir, Patan, Bhaktapur and Kathmandu Durbar Square, covering almost every bit of the splendor of authentic antiquity. Featuring the vast array of heritages in the attire, she hopes to convey the message of unity and love to all. The headpiece has every intricate detail of Swoyambhu, the epitome of peace and integrity. It harmonizes with the whole gown, along with the earrings which are made up of small bells. The hair is braided and “dori” is used, typically seen in old villages and small towns of the country. Adorned in elaborate and detailed accessories and garment from head to toe, this whole concept is a unique approach to reflecting Nepal. The bright spectrum of colors aptly defines the distinct liveliness of Nepal. The world of fine arts, fashion and culture don’t always go hand in hand. However, the gown made by Anita has been finely executed, considering the attention she has given to every single fine point in the gown. Anita has certainly set a mark, and has created something noteworthy. The dabbling, the mixing, and fantastic results that come from the fanciful play of paint and fabric had our jaws dropping. Currently working on her thesis, the soon to be fashion designer Anita Khati Chetri has a lot more to offer us in the near future.